Markets had a hard reset in Q4 with the election of Donald Trump on November 8th. Initially global equity markets plunged, but within hours began to recover and rallied strongly throughout the quarter, mostly on speculation that the new president would usher in tax cuts, deregulation and a sweeping fiscal spending program. Coupled with strong economic data and another hike from the Fed in mid-December, bonds were left in the dust during the quarter reminding investors that old rules of diversification are flawed. To paraphrase one of our managers, “it’s counterintuitive to suggest that, if one aims to avoid losses, one has to take on more risk than Treasuries.” Throughout this initial bout of euphoria, we remain mindful of the fact that margins and valuations for equities are near all-time highs, interest rates remain at historic lows, that the business and credit cycles are in a mature stage and that we are faced with a wider possibility of policy outcomes (fiscal, monetary, regulatory and political) than we have witnessed in generations. While we see a real possibility that the economy may be moving from monetary-led to fiscal-led growth, it is likely to be a rough process given underlying political fissures in Congress. The three core tenets of Trump’s proposals are, without a doubt, pro-growth. They are also, however, just proposals at the moment. Despite there being single-party control of all three branches of government, Trump will need to form a coalition of lawmakers from a party that is now home to both free-trade conservatives and strong isolationist voices; between the deficit hawks of the Tea Party and those who are willing to support large fiscal expenditures in the face of sweeping tax cuts; and between the libertarian ideals of a hands-off government and those of a leader who has at times brought a command-economy mindset to pricing, production, and investment. Just which Trump shows up in the Oval Office, as they say, and how these disparate voices reconcile to make policy will be an interesting and, at times, potentially volatile process. Meanwhile, the Federal Reserve and the dollar are shaping up to be a thorn in the side of Trump’s economic ambitions. Almost immediately after the election, Fed Chairwoman Janet Yellen spoke directly against the need for fiscal stimulus. At this point in the economic cycle, she argued, the economy is near full employment, the economy’s output is close to its full potential and the time for fiscal spending has largely passed. Later in December, upon raising short-term interest rates by .25%, she indicated the Fed would stand by to adopt a more aggressive rate stance to protect the economy from overheating in the event that the economic outlook shifts due to changes in fiscal spending or other economic policies. She was not alone in her thinking; the summary of economic projections released by the Fed at the time indicated that the Fed’s policy setting committee expects to raise rates three times in 2017, more than has previously been communicated. Both the tough talk from the Fed and the prospect for more pro-growth policies from a new administration sent the dollar soaring against other major currencies in November and December. Not unlike the early years of the first Reagan term when a more aggressive Fed was accompanied by an administration focused on deregulation, tax cuts and fiscal expansion, a persistently strong dollar could have the unintended consequence of choking off US exports and undermining Trump’s dream of a resurgent US manufacturing sector. Political and policy uncertainty has come to the forefront of what is likely to drive markets in the short run. Data continue to point to a strong underlying economy, supporting higher interest rates, but an uncertain global political environment has the very real potential to overwhelm day-to-day data points. A reset of the US relationship with NATO, potential trade wars with major trading partners, an emboldened and adventurous Russia, a reworking of the one China policy; Trump’s positions are both bold and unpredictable, characteristics that have the very real potential to unsettle markets as the world digests Trump’s new world order. 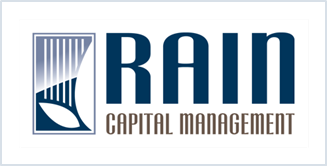 Rain portfolios remain prepared for a material rise in equity market volatility in the short to medium term and continued pain in fixed income markets for some time to come.